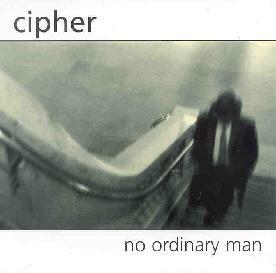 Cipher - "No Ordinary Man"
The ambient unit Cipher is Theo Travis on soprano sax, alto flute, piano, keyboards and samples and Dave Sturt on fretless bass, programming, samples, and loops. AI readers may be familiar with Travis’ work with Gong, Porcupine Tree, Bass Communion, and Steve Hubback. What he and Sturt do with Cipher is create gentle, haunting soundscapes usually with a mellow, and often melancholy, jazzy feel. It reminded me often of Brian Eno’s work, especially from the early 80’s such as Ambient 4: On Land and The Pearl. With the help of guest musicians Richard Barbieri and Steven Wilson of Porcupine Tree, Sturt and Travis explore a number of different contemplative moods, from the twilight mystery of the opening track, Dusk, to the limitless realms of the mind evoked in Bodhidharma. Rabbi Gaddi Zerbib also contributes vocals to the stirring, Middle Eastern influenced Desert Song. The final, title track of the album, features the gorgeous and thoughtful flute work of Travis, set to a subtle percussive loop and Sturt’s poignant bass playing. This is music for your quiet, reflective times: ambient music with melody and imagination, soundscapes that stimulate the mind and satisfy the soul. For more information you can visit the Cipher web site at: http://www.cipher.f9.co.uk. Visit the Theo Travis web site at: http://www.theotravis.com.